Homeowners with a busy family or who love to entertain often, have some special challenges when it comes to finding the best flooring for their home. They need a floor that can stand up to lots of wear and tear. A floor that is easy to clean is pretty high on the list as well. And they still want to be able to select a style of flooring that matches their decor and style. 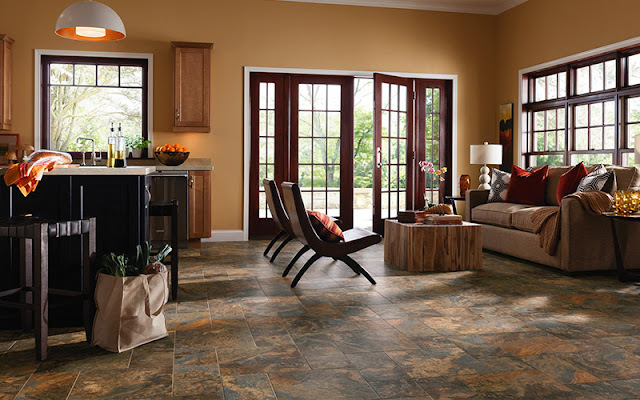 All of that can seem like a tall order, but it's not for hard surface flooring such as tile or luxury vinyl. Simply put, it's the most durable flooring on the market today. Hard surface flooring like tile and luxury vinyl stands up to spills. These floor options are moisture resistant - some are even waterproof - so there's less to worry about from water damage or spills. It also handles foot traffic without showing wear patterns for years. There isn't a floor that's easier to clean than tile or luxury vinyl either, sweep and mop regularly and you've got a clean floor. Tile and luxury vinyl are available in a wide range of styles and colors. From extremely realistic wood designs to natural stone or stone look-alikes, there's sure to be a design of flooring you like in the range of tile and luxury vinyl. Learn more about types of luxury vinyl - also called resilient flooring. Where can you install hard surface flooring? Anywhere you'd like! There are a few more restrictions with tile flooring because it requires an even subfloor. However, luxury vinyl can be installed on top of just about anything. Basements. Bathrooms. Kitchens. Hard surface flooring stands up to all of their challenges and still looks beautiful year after year.